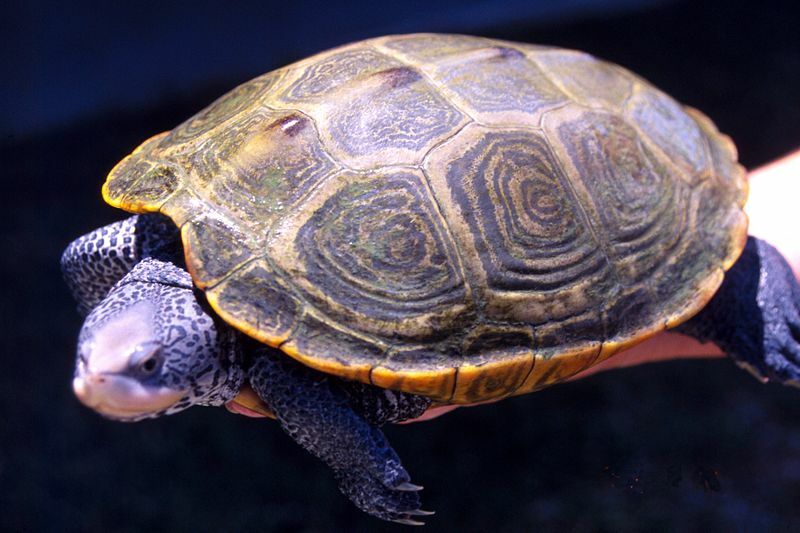 Terrapin meaning edible turtle in brackish water. (their jaws are strong and able to crush the shells of these). Predators include foxes, birds, raccoons, skunks and muskrats. or patterns on their backs. found basking on logs in warmer weather. in this case, the females are larger. Warmer areas produce larger turtles in this species. the females are a bit bigger at 7.5 inches. because of its popularity as a food source. their only protein source, that they began complaining. the Eastern Seaboard from New England to the Florida Keys. buried in the mud of their local environment. by several states, including New York. over hunting and/or drowning in eel or crab traps/pots. to buy on countless web sites.